The first time I went to Paddy’s I was to told to watch out for the Audis and Beamers parked along the street. It may be located in an unprepossessing backstreet pub but, said my pal, successful Asian business types now domiciled in Stoneygate still flock back there for great value, desi-style food. I could understand why. It was a welcoming, unpretentious place offering a great range of food in a buzzing environment. I wasn’t surprised when a few years later in 2011 Jamie Oliver found his way there and featured the place in his Jamie’s Great Britain series, enjoying a trip round Leicester Market with chef Amita Mashru before cooking a dish at the restaurant. But such fabulous publicity doesn’t always do a place favours. It was already a successful restaurant, would it now get ideas above it self? Move away from the generous, down-to-earth style that made it so popular? I forced myself back there to check out. As we drove down Martin Street – a dark, sparsely-populated side-street off Catherine Street – I was reassured to have to park up some way from the restaurant, and immediately behind a rather large BMW. Inside the door, again I was pleased again to see nothing had changed. It’s still a resolutely unimproved venue – it’s décor is standard inter-war estate pub, but instead of horsebrasses the walls are adorned with black and white pictures of Bollywood stars. It’s lack of any contemporary styling though is one of its most appealing aspects. No body is dressed up, no body is trying to impress, everybody is just there to share good food with friends. There are families, couples, big groups and small groups all busily chatting away while cheerful waiters glide around bringing large platters to their tables. It’s one of the most unobtrusively efficient restaurants I’ve ever witnessed. The choice is wide but you don’t the impression this is a case of there being just one mother sauce in the kitchen with a few additions thrown in here and there to fill out a menu. This is a busy restaurant, with lots of staff, producing lots of fresh food – they can handle a wide menu. Our starters are wonderful. Crispy chilli aubergine is a dish in the popular Indo-Chinese style – a huge pile of sweet, juicy aubergine bites, given a crisp from a hint of batter which has been stirred through rather covering each piece. With sweet red peppers, spices and a lick of sauce it was fabulous food, though better as a part of shared approach to starters than as a dish to be consumed all on its own. Sheek kebab – four fat sizzling spiced and minced lamb kebabs in a starter portion – were surprisingly delicate and the rangeeli tawa fish were magnificent. A tad oily for some perhaps but lovely firm fillets of fish in vibrant spices from India’s North West. A really exuberant dish. Despite being rammed on a Tuesday night our waiter was calm, friendly and thoughtful, taking plenty of time to advise on our ordering and explain the dishes. With food this appealing, presented in such quantity (mains all come with rice and naan bread) it’s easy to over order but repackaging of left overs for you to take home is offered as a matter of course. Not that there was any danger of that with my lamb chop curry. Not the tenderest lamb I’ve encountered but these cutlets bore the hallmarks of a long marination and quick grilling. They came in a big bowl of lively sauce and simply cried out to be picked up and gnawed until the last gobbet had gone. Not a first date dish we agreed. More fish loveliness was had with kathiawadi masala fish – a dryer dish with a fresh, herby masala deriving this time from Gujarat. A third main course was simply billed as “traditional chicken curry”, and with a place such as Paddy’s you feel confident with whatever they deem traditional. Not much more to say other than it was lovely – and you can order it as mild or hot as you fancy. It’s not easy reviewing Indian restaurants in the UK. Everyone tends to have their favourite and many don’t want to venture much further. But anyone who misses Paddy’s is missing a treat. There is cuisine from all over India, and dishes ranging from homely vegetarian choices such as rajasthani egg curry or gungo peas with fenugreek, to the East African-influenced chicken machoosi and those wonderful spice-laden fish fillets. But it does not play heavily on notions of authenticity – it’s just a place that says “this is our food, come and try it”. And you should. 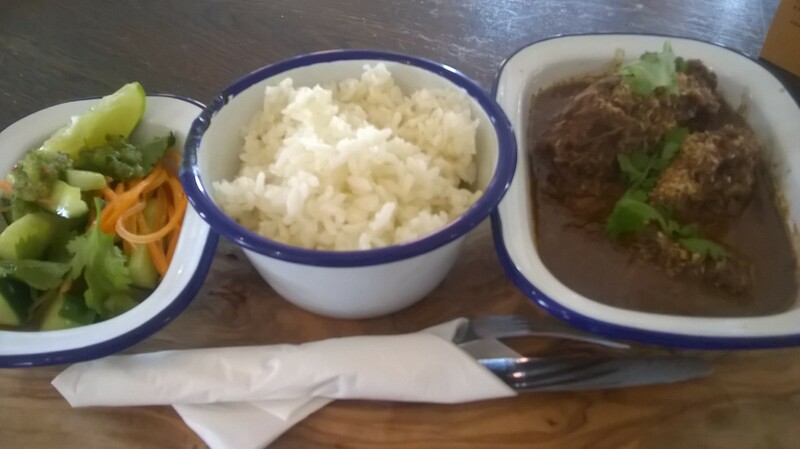 I enjoyed a splendid lunch a St Martin’s Tea and Coffee today – a beautiful rich and warming rendang curry made with ox-cheek along with zingy salad with lime and coriander dressing. The beef (liberally covered in toasted coconut) had clearly been cooked for many hours, overnight quite possibly, and was tender as you like. Having also had a great satay a couple of weeks back and then yesterday reading Leicester Veggie’s enthusiastic review of her vegan Jakarta Gado Gado, I wondered what was prompting this South East Asian fest. The answer is a new chef has joined Chris Elliman and his team and it’s Bobby Ananta from Java. You might have seen Bobby preparing a fantastic seabass dish in one episode of Nigel Slater’s recent series Eating Together. It seems he had been managing a coffee bar in Leicester, and it’s great that he’s now getting a chance to cook. And more good news in that while he’s starting off with one or two of the more well-known dishes, in due course he’ll be pushing the boat a bit more. In particular watch for a ticketed mid-week event being planned that will involve a full Indonesian menu. 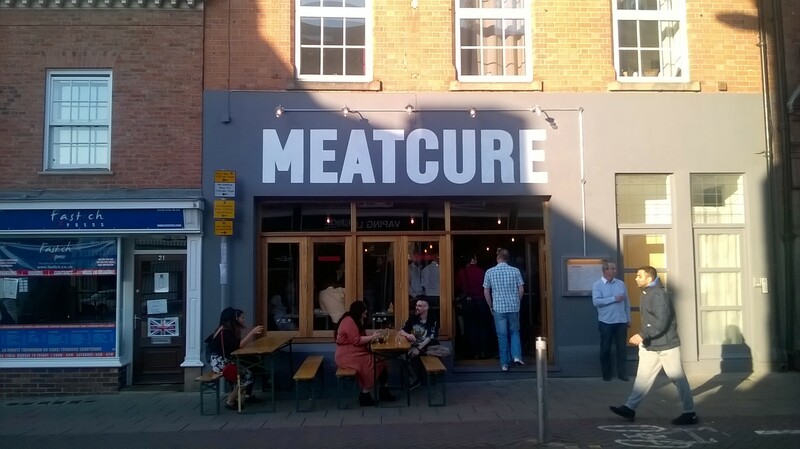 A welcome for “burger shed” Meatcure, which launched its Leicester branch last night and adds another lively, motivated independent outside (just, but definitely outside) of Highcross. I reviewed their Harborough operation and was impressed with the burger, the bun, the beer and their general approach. The grass-fed, dry-aged meat is from Joseph Morris in Kilworth, the brioche bun is the result of a prolonged process of refining with Harborough bakers Emerson and West and the care and attention shows. Having had a few tasters at last night’s launch, the spicy chicken wings and ribs seem pretty good too. The brunch menu served from 9.30 looks appealing too. It’s a simple, stripped down sort of place but should have a quite wide appeal. Every city needs people with a local commitment doing quality food and, along with Crafty Burger, these guys are showing it can be done for the burger. Find them at 19 Highcross Street, an area which is now gathering a fair number of interesting places to eat and drink. Here’s my Leicester Mercury review of John’s House in Mountsorrel – a lovely night out with beautiful food. It’s a real boost for the county that someone’s doing food like this – and I know that the tourism folk are delighted. We should probably get something clear straight away. John’s House won’t be for everyone. Not just because of the considerable cost, but because chef John Duffin and his team are trying something unusual for Leicestershire in offering precise, contemporary, sophisticated fine dining. 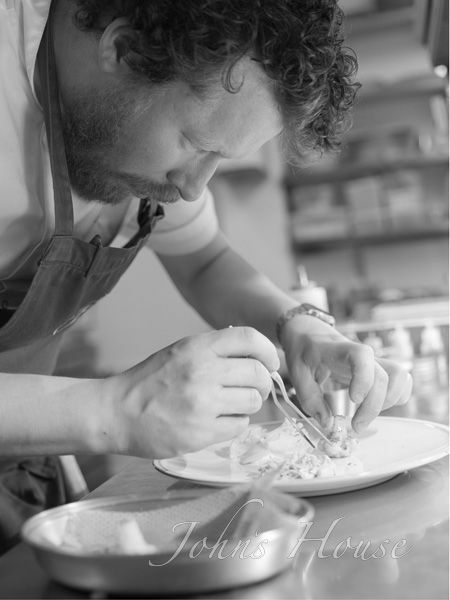 Duffin has returned home to Mountsorrel after learning his craft with some of the nation’s most respected and innovative chefs, including Claude Bosi and most recently Simon Rogan at Roganic in London. Given the alarming closure rate of London restaurants as rents go through the roof, coming back to Leicestershire to launch out on his own is understandable. But just as important is that “home” is Stonehurst Farm, known to many in the county for its family farm park, and an immediate source of some fine ingredients. In addition there was a largely unused part of the family home ripe for conversion as a restaurant. It all just added up. Indeed it is the domestic feel of John’s House that strikes you straight away. From the moment you sit down in the lounge, the sense is of a dinner party at a friend’s house. Only your friend has worked in kitchens with two Michelin stars. The fun starts almost straight away with some phenomenally good canapes served as you read the menu. A little tomato macaron defied expectations by being intensely savoury, dusted with powerful tomato powder and filled with a vibrant green basil cream. 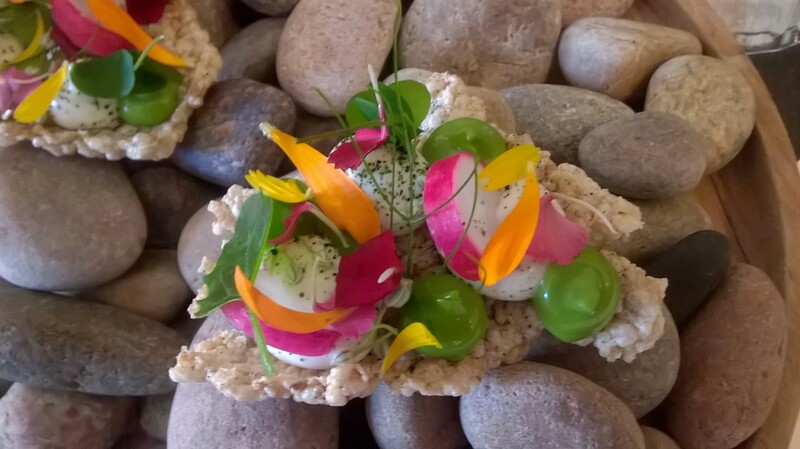 These were followed by a toasted barley cracker, which looked like a hideous dieter’s crispbread but was a deeply flavoursome bite, loaded with goat’s cheese and decorated with radish, flowers and more herby gels. Finally there was a little cornet of an unbelievably rich and silky duck liver parfait with a shot of cumberland sauce and topped with crispy chicken skin. It was a mere morsel but my goodness was it good. Presented with real panache and showing wit, skill and creativity these really set the tone for the evening. Farm and kitchen garden produce is the key to this restaurant’s approach. This is ingredient-led cooking where the quality of the produce dictates the dish and what might seem humble items are raised to superstar status. A starter of heritage tomatoes heaped shame on the produce of Dutch greenhouses. 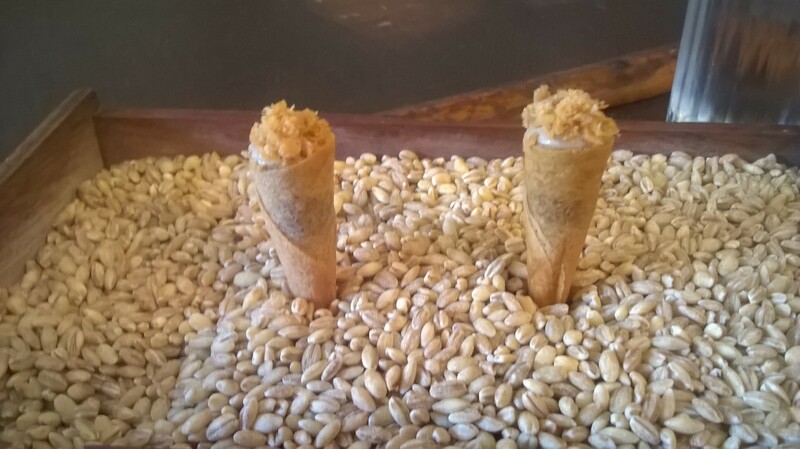 A variety of shapes and sizes, they sang out lustily with flavour, garnished with some crunch from buckwheat and flavour from frozen parmesan (bit of a molecular cuisine favourite, this). It might have seemed simple but there was an awful lot happening. In our other starter it was peas that took the lead role. Tiny, fresh little blighters from the garden, they were beautifully sweet. They came with onion dumplings, which scored highly with flavour but I wasn’t converted by the somewhat mushy texture. The dish was completed with terrific roast shallots and a light, creamy sauce with background flavours of mint and lime. This was top rate seasonal cooking, with dishes being tweaked by the week almost according to what’s coming through in the kitchen garden. The same approach was seen in the mains – hogget (year old lamb) from the farm was served up earlier in the year with wood blewit mushrooms, but now came with baby courgettes, more of those remarkable tomatoes, and a little salty feta cheese. The belly and shoulder of hogget was delightful, though my favourite element was a little crumbed nugget of sweetbread. 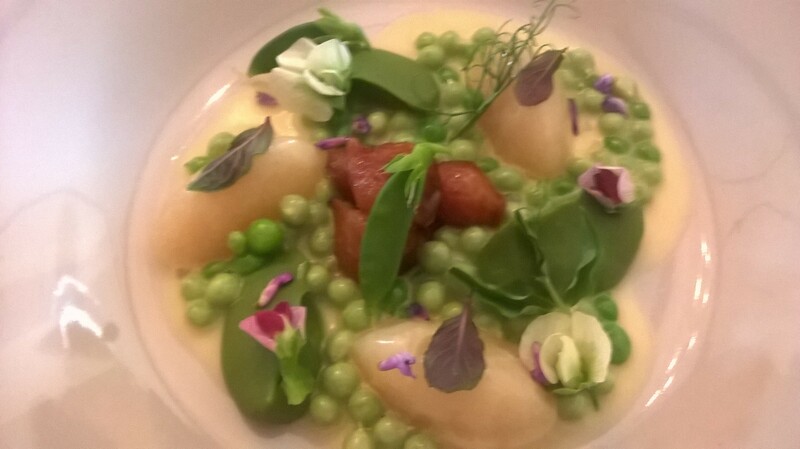 In the other main some earthy, full-flavoured pollack came with a summery collation of peas, potatoes leaves and flowers, with some smoky flavour from shavings of lardo (cured pork fat). All of this went together swimmingly but there was a quenelle of a sort of lemon confit that was a big blunderbus of flavour that for us didn’t sit comfortably. A quick word on the wine list – if you tend to read these from the bottom up, be prepared for an intake of breath as you find the legendary Penfold Grange and Chateau Mouton Rothschild at £750. If your budget is more Leicester Mercury than Freddie Mercury, the top of the list is £18. Deserts were perfect little seasonal masterpieces. Macerated strawberries came with a superb strawberry sorbet, strawberry snow, hay-flavoured custard and an inspired syrup made from the delicately aniseed-tinged leaves of sweet cicely. It was a tremendous culinary expression of an English summer day. The same could be said of our other desert – a combination of white chocolate with elderflower sorbet, raspberries and pistachio that brought almost embarrassingly loud and persistent sighs of pleasure from my dining partner. We finished up with peppermint tea – by which I mean huge sprigs of peppermint infused with hot water – and some great petit fours such as lollipops of white chocolate with violet cream and a hibiscus macaron. John’s House has been open since late last year, so the guidebooks may be just about ready to catch up with the place. Whatever they ultimately make of it, we should be pleased that John has come home to push the boundaries of Leicestershire’s dining scene that bit further. Just a quick preview of my forthcoming review of John’s House in Mountsorrel. I’ve been wanting to go ever since it opened but it takes some time to marshall resources and I wanted to make sure it had fully found it’s feet. It’s a hugely interesting place providing a comfortable, intimate dining experience with food of a very high standard and dishes that stem from applying real creativity to simple but excellent produce. It’s based on super-fresh, bang-on seasonal produce much of which is grown or husbanded on the family farm out back. These are just snaps and don’t do justice to the beautiful dishes but they give an idea. I hope whoever took some pictures for the Mercury did a better job – I’m sure they did. If you are interested, get the paper next Saturday. Onion dumplings, roasted shallots, peas. First off, don’t mistake this venue for Kuru Kuru, the splendid little sushi bar on Welford Rd, Leicester. It’s in Loughborough and as you’ll see from my review below, done for the Leicester Mercury, it’s recently refurbished and rebranded from The Noodle Bar – and if that sounds familiar beyond Loughborough it’s because this is latest version of the old Noodle Bar on St Nicholas Place (where the Clockwise Credit Union now sits) and which – research tells me – is very fondly remembered by many in Leicester. Singapore is one of the world’s great multicultural communities and food is a national obsession. So when a friend with roots there recommended a pan-Asian restaurant to me, I took notice. It turns out that Kura Kura is something of an old friend anyway. It’s owned by the people who some time back ran the Noodle Bar on St Nicholas Place in Leicester, a cheap and cheerful canteen where I would often fill up with something tasty from a wok. The Noodle Bar reappeared in Loughborough a few years ago, out the back of the White Horse, an otherwise unremarkable boozer on the edge of the town centre. 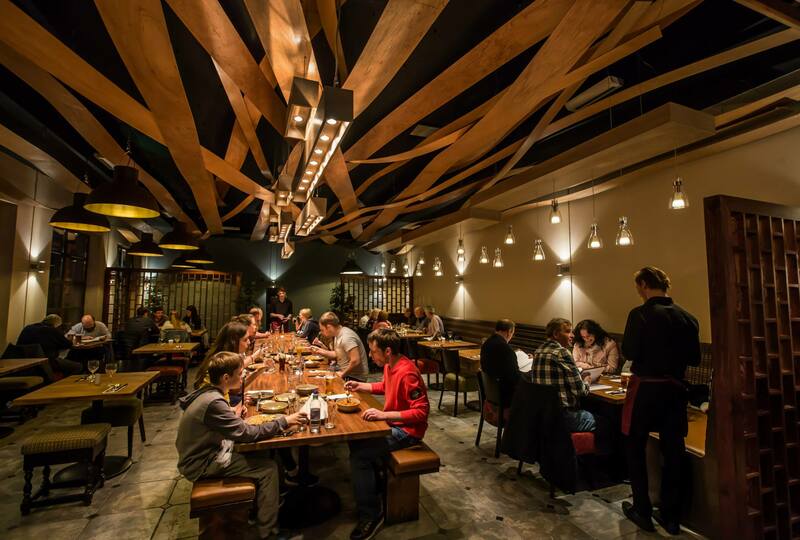 Earlier this year the whole venue was rebranded to Kura Kura, along with a substantial refit and a general uplift to the menu. A couple of the signature communal benches remain, but the others have been cut up and turned into a selection of two and four-tops, and there is an area offering a Japanese-style low table along with cushions and tatami matting. There’s also a striking ceiling made from sinuous, twisted strips of wood, very reminiscent of a bowl of noodles. There is a bit of an issue with acoustics, it does seem to be quite noisy, but all in all it is pretty stylish. The menu is thoroughly appealing and very reasonably priced. There are appetisers ranging from miso soup with tofu and watame seaweed, through to Indonesian spring rolls, prawn gyoza dumplings and a Cantonese take on crispy aromatic duck, shredded at table and served with pancakes, spring onions and red miso sauce. There’s even a Peruvian-style ceviche with spicy yuzu dressing – actually Japanese-Peruvian fusion, known as Nikkei, is huge fashionable in foodie circles and there’s an obvious link between sashimi and citrus-cured ceviche. We picked Thai squid – or calamari as it is deemed here. This was a large bowl of tender, marinated and seared, bite-sized pieces of squid with bagfuls of flavour from juliennes of fresh ginger, green peppercorns, sesame and an umami-rich sauce. A snip at £4.95. We also had “hairy prawns” three huge shelled prawns, rolled out and wrapped in katafi, thinly shredded filo-style pastry you might be familiar with from Greek or Turkish sweets. Here though, as well as a touch of humour and visual appeal, it adds a savoury crunch. With a spicy wasabi dressing these were another real treat. Main courses on offer include grills, stir-fries, curries, spicy soups and a range of rice and noodle dishes. Our Stargazer monkish curry was a full-on, feisty affair with a large amount of firm-fleshed fish with plenty of red chillis, fennel and green beans retaining plenty of crunch, all in a red curry sauce spiced up with krachai or “lesser ginger”. Again, good value at £6.95. We added a freshly-made roti, a truly outstanding flaky flatbread that was a great accompaniment. We also had a Sulawesi nasi goreng. While this didn’t look especially appealing – a huge, monochrome pile of fried rice – there was plenty going on in there with flavours from finely diced ingredients including smoked chicken and spring onions and side salads of pickled cucumber, tomatoes and black hijiki seaweed. In truth it wasn’t a very balanced plateful but with our additional bowl of wok-fried bok choi with mushrooms, this was good comfort food. With its generous portions, keen pricing and lively atmosphere it is not surprising Kura Kura is hugely attractive to the town’s famously sporty students. But, while this is obviously not haute cuisine, it should also find favour with with a more quality-focused clientele who will enjoy its bold approach to flavour and some of the skilful cooking on show. I walked out already mentally picking dishes for my next visit.